Even casual dance fans have heard of the Christmastime classic "The Nutcracker," but what about "The Mutt-cracker?" The humane society fundraiser features a misshapen little mutt named "Pig" as the pirouetting pet of the Sugar Plum Fairy. The show has been performed by the Birmingham Ballet for the past five years. This year's version was staged Friday to a near sellout crowd at the city's main concert hall. During the show, a black Great Dane cavorted with Drosselmeyer, who presented his niece Clara with a magical Nutcracker, and a spaniel trotted out on stage with cast members. A pack of pugs did what pugs normally do: They sat and snorted. 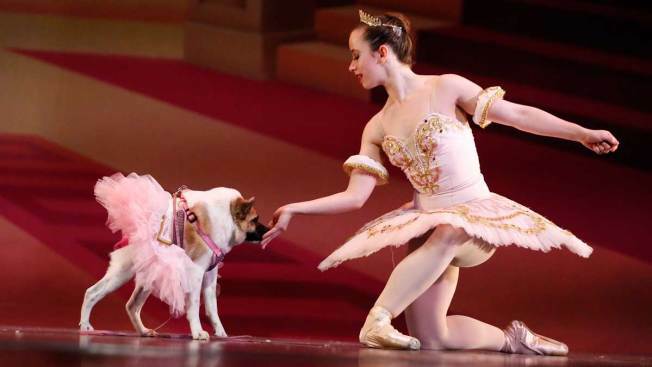 Pig, outfitted in a pink tutu, was a featured performer, dancing alone with the Sugar Plum Fairy. Born with a condition called short-spine syndrome, the 3-year-old dog hops somewhat like a frog to stand up and has hunched shoulders that make her gait appear somewhat gorilla-like. Owner Kim Dillenbeck said being around so many people and dogs in the theater was unnerving for Pig, whose Facebook page has more than 100,000 followers. "She is so easily startled because she can't move her head at all; her head is fused at her shoulders," Dillenbeck said. "So for her to come to a place that has lots of noise and stuff is very difficult." But Pig was a trouper, especially when given an incentive: During a rehearsal, ballerina Katherine Free held a treat up in the air to get her to twirl about at the end of a leash. Free marveled at Pig and the 28 other dogs cast for the show. Only a few of the animals were trained performers, and many were rescues. "They give so much to the stage and project to the audience more than you might think, and it's amazing to see them grow from even their rehearsals to being on the stage," Free said.